some of the world's greatest distance runners. "I was 10 or 11 years old and watching the Olympics on television," Estifanos said. to school in the morning." country runner of the year. as a junior and then at Lynbrook, Toro Park and Central Park in Santa Clara as a senior. then started experiencing foot pain. 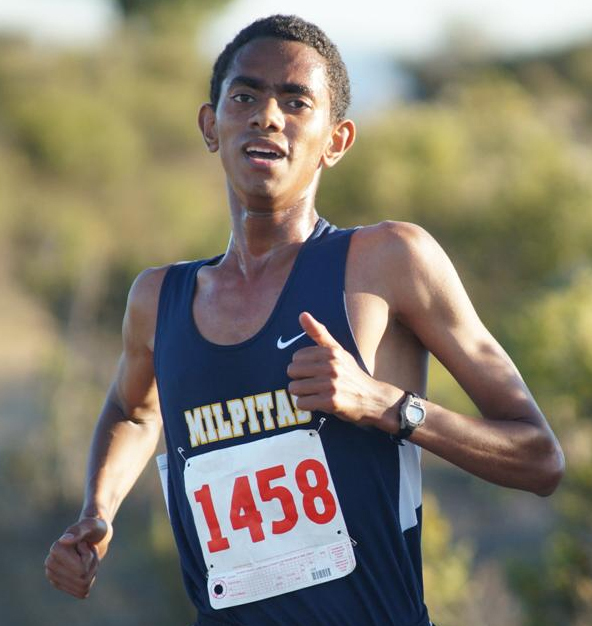 "After that he followed a minimal training schedule,'' Milpitas coach Bridget Hall said. of 9:09.12 and had a best of 9:08.06. The goal as a senior is to break 9 minutes. and said he's leaning towards UCLA. inspiration that got him started on his path as a competitive runner. Terence Rabuzzi, Los Altos, Jr.
Eduardo Garibay, Yerba Buena, Sr.
Ciaran Murphy, St. Ignatius, Sr.
Patrick Cummins, St. Ignatius; Tanner Sartwell, St. Francis; Ryan Dimick, Carlmont; Daniel Chiriaev, Prospect. results as a senior, it was a good decision. 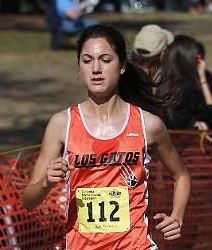 Division II race, earning Mercury News girls cross country runner of the year honors as a result. good to be back. The time away made the success I had that much more rewarding." country this fall due to a stress fracture that put her in a cast for 10 weeks. conservative approach to training and focus on long-term goals." finals and qualifying for the state meet. that I had success in cross country, it's hard to say what I'm going to do." considering an emphasis in a pre-med course of study. Danielle Katz, Los Gatos, Sr.
Maya Weigel, Mountain View, Sr.
Lauren Jacob, Los Altos, Fr. Kendall Hacker, St. Ignatius, Jr.
Molly Haar, Archbishop Mitty, Sr.
Zoe Enright, Menlo School, Fr. Melissa Reed, Mountain View, Jr.
Katie Foug, Palo Alto, Soph. Lizzie Lacy, Menlo School, Soph. Olivia Brobst, Archbishop Mitty, Jr.
Gillian Belton, Sacred Heart Prep; Ashley Lara, Valley Christian; Ashley Mathews, Santa Teresa.